Note: This article was updated in February of 2019. First person shooters are by far the most popular games in the world. Due to their popularity, shooters have been made into the subject of movies based on video game licenses like Doom and Max Payne, and also used as influences in films like Gamer and Shoot ‘Em Up. The flip side to that is that they’ve become the targets of lazy politicians and gun lobbyists who seek to blame their popularity on violence in schools instead of looking elsewhere—towards ‘gun culture’ in general, and to the availability of firearms at retailers. Needless to say, shooters aren’t going away any time soon, and some of them—such as the ones we’ve listed ahead, are entirely free to play so you can get a solid experience without having to pay a single cent for the experience. These games are completely free and tend to get updated with new content. It’s worth noting that we are not listing these games in any particular order and all are worth checking out. Likewise, because these games are free-to-play the titles will come and go and as a result we’ll continue to monitor the game and make note if any server shutdowns have been announced. As a result, please check back often for future updates. Return to Castle Wolfenstein is one of the earliest instances that a high quality, and fully polished first person shooter was made available for free beyond what was typically available in the form of mods for existing games. Developed by Splash Damage, it was originally designed as the multiplayer mode for Return to Castle Wolfenstein but was released instead as a free standalone download. Enemy Territory: RTCW was a new breed of game that saw two teams—the Axis and Allies—battle each other not for flags or points, but for actual territory. With one team on defense and the other on offense, players on both teams were divided into various classes to better supplement their team’s capabilities out on the field. Despite being over a decade old, the game still enjoys a healthy online community. Dirty Bomb is a free-to-play first-person shooter from the makers of Brink, Quake Wars: Enemy Territory and the venerable Wolfenstein: Enemy Territory. It goes without saying that no one does class and objective-based multiplayer gameplay quite like Splash Damage, and it really shows with Dirty Bomb, which is a follow-up of the iterations and evolution of the multiplayer gameplay of their previous titles. Best thing about it is that it’s free to play. A good game that’s free? What more could you ask for? Developed by Adhesive Games, Hawken is a first person shooter in which you pilot the body of a gigantic mech and fight your way across wartorn cities in conventional team deathmatch and free-for-all modes as well as a more in-depth “siege” mode that sees two teams fighting it out for the control of territory. Players can choose between three different classes of mechs, and instead of managing their ammo, they have to manage their heat—as their giant guns are prone to overheating when fired continuously making battles intense if you’re dealing with multiple opponents at once. Apex Legends was a surprise video game release from developers Respawn Entertainment. After EA had acquired the development studio, it was believed that the only real game on the development team’s plate was Titanfall 3 but in early February of 2019, Apex Legends was announced along with released into the market. This is a battle royale video game title which takes place in the same universe of Titanfall. In fact, the game is set just a few decades after the events of Titanfall 2 and it plays similar to other battle royale focused titles such as Fortnite with mixed hero focused characters. In the game, players are divided up into squads of three with a total of twenty teams. Each player then picks a character which will have their own unique abilities and attributes. When the match starts, players are dropped into a large map where they must rely on fellow teammates while scavenging for resources and weapons. As the map size shrinks, players must work on defeating all of the opposing teams in hopes that their team is the last standing. There are the traditional microtransactions within the game such as Respawn Entertainment’s take on loot boxes but the title is certainly gaining plenty of gamers as already the title received over twenty million downloads in its first week. Tribes Ascend is the successor to the highly successful Tribes series of games by Dynamix from over a decade ago. It’s also the first one in the series to be entirely free to play. Players can enjoy the game by simply playing it for free or paying for weapon upgrades and additional utilities for their characters. Much like the original games, Tribes Ascend allows players to traverse and battle across vast stretches of terrain and even board flying fortresses with jetpacks and ski to improve their speed while on the ground. Fans of the original games should feel at home with this one. Team Fortress 2 offers a variety of game modes, ranging from simple Capture the Flag and Team Deathmatch, to a mode called Push the Cart in which one team attempts to move a cart across the map while the other team sets up defenses to prevent it from going through. There’s even a variety of variations on these modes, which see both teams pushing separate carts. The game also plays host to a variety of objective control modes and a bomb delivery mode. In addition to all of those competitive team-vs-team modes, players can also indulge in a cooperative ‘horde’ mode called Mann vs Mann, which pitches players against throngs of robotic enemies across a variety of maps. The game’s complexity is increased several fold with the division of character classes, which help to provide players with discernible roles out on the field, and a large variety of weapons and customization. One of the game’s biggest draws is its use of hats and other decorative equipment, which can be acquired simply by playing the game, or as bonuses for purchasing other games on Steam. The original Planetside may have died a miserable death when developers were moved off its team, but SOE opted to give the franchise another chance with a sequel a few years later. The game rose out of the ashes of its predecessor like some mythical bird, soaring into the heavens and quickly became one of the most engrossing first person shooters to date. Planetside 2 sees full scale battles taking place over the face of the planet Auraxis, where three distinct groups battle for territorial dominance. They have at their disposal numerous vehicles and weapons to allow for a futuristic experience of war. but be warned that this isn’t a game that’s easy to pick up and play. You’ll need to invest some time in getting with a dedicated group of players and staging assaults, or you may find yourself lost and alone without a clue as to your objectives. Note: This game is slated to be shutdown within March of 2019. Blacklight Retribution is a sci-fi themed FPS in which players can join any number of servers to partake in online battles against many other players. The game is split across a variety of game types and maps, largely offering close quarters battles in which players engage in classic death match modes, capture the flag, or fight for dominance over specific objectives on the map. Blacklight’s maps are filled with weapon depots, in which players can purchase upgrades with points accumulated during play, for ammo, better weapons, and even hardsuits, small-sized mechs that can be mounted by players to provide an edge on the battlefield. One of the game’s biggest feats is the customization of weapons and armor. Players can upgrade their kit by accumulating in-game money, which is acquired through play and leveling up, or use real-world currency to purchase these items permanently or lease them for a short period of time. Warface was developed by Crytek which launched on the Windows platform back in 2013. The video game offered players different classes to choose from such as being a sniper, rifleman, engineer, or a medic . Within the game, players could be a Sniper, Rifleman, Engineer, or Medic and each of these classes offer their own different role that could come into play during matches. Likewise, the game offered the ability for players to customize their weapons. However, most of these weapons require Warface Dollars and as expected Warface Dollars could be bought within the game through real currency. With that said, Warface Dollars is also a reward during matches thus allowing players the ability to enjoy the game a bit more freely than having to feel forced into spending money in order to play a bit more competitively. The game is still currently supported on the PC platform, however, since its launch on the Xbox 360 the port was officially discounted in 2015. 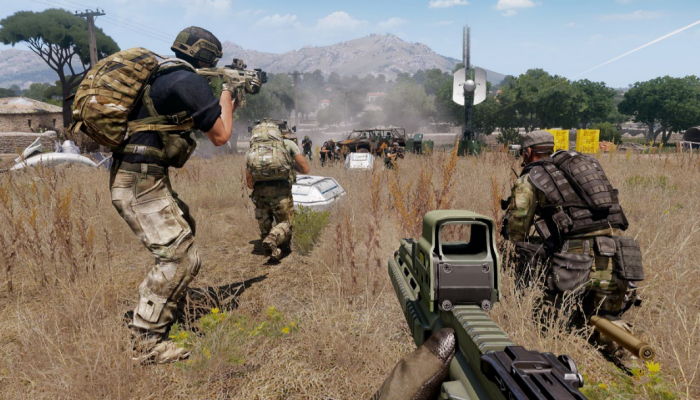 Developed under Bohemia Interactive, Argo is a tactical style shooter that launched in 2017. The video game is a free-to-play MMO that is set on a fictional island known as Malden where a space station has crashed. In the game, players are a mercenary for one of two rival factions in which the goal is to claim the remnants of the crashed space station. However, there are various modes available to enjoy as well such as Combat Patrol, where players must complete a variety of tasks or Link, a game mode that is set in a smaller map where players must hack a central computer. Another interesting aspect that may be well worth making a note about is that Argo features a scenario editor. Being a newer title, we expect Argo to stick around for quite some time. Note: Currently in early access. Quake Champions is the latest Quake main entry title since Quake 4 released in 2005. This is another fast-paced arena FPS where players will face against each other with a roster full characters that have their own unique abilities and traits. Likewise, you’ll even find some new faces in the roster such as B.J. Blazkoicz from the Wolfenstein series along with the infamous Doomguy from the recently rebooted Doom franchise. If you like classic style Quake then this is definitely a must-play however, at the current moment the title is only in early access. Regardless, publishers Bethesda Softworks have stated that the game will be a free-to-play title and will be supported through various means such as a battle pass model that would give players an extra few cosmetics and in-game currency by completing select weekly challenges. Often considered an Overwatch clone, Paladins is still a fantastic game. There are some slight differences between the two hero-based shooters, but you’ll still find that each hero in Paladins will have their own unique abilities that they can bring in to the fight. Luckily, with Paladins, you can enjoy the game across several platforms making it a video game well worth trying out. With hero-based shooters becoming popular, Paladins is one of the video game titles that continues to make its way on gamers consoles and PCs. Likewise, the video game also holds a number of different gameplay modes which can be as simple as a Team Deathmatch or more focused missions type modes such as Onslaught where players must capture an area to gain points. Line of Sight is another FPS title that launched in 2017. The video game was developed by BlackSpot Entertainment in which the developers call their video game as if BioShock series mashed with the Call of Duty franchise. Not only will players have a wide array of weapons to choose from in their battles, but developers also play on what they call psyonic abilities. It’s with this added psyonic abilities supernatural abilities that players can use towards their advantage in taking out opponents or as a means of a support. Likewise, there is a number of maps to go through as well with over twenty different locations scattered around the globe. If you’re looking for a real free-to-play experience without other gamers spending money to improve their weapons or stats then Line of Sight may be your best bet. Developers have stated that there are no weapons that can be improved with real-world currency. Another 2017 release that makes our list is Black Squad, an FPS that has quickly started to make a name for itself. The video game was developed by NS Studio and originally released in Korea but it only recently started to spread to new markets. Black Squad acts as a fast-paced military strategy shooter with an emphasis on free-to-play. Luckily for players, there’s no feeling of being at a disadvantage if you don’t opt to purchase anything in-game. Developers have made the game in which microtransactions are not required, instead, everything within the game can be bought with in-game currency that’s rewarded as you play. We’re interested in seeing how Black Squad grows as right now the title is only available as an Early Access game through Steam.